I’ve been learning to embrace the deliciousness of easy recipes in recent months. In the past, I thought the sign of a good recipe creator was how imaginative their recipes were. That is until I noticed what magazine recipes I was actually trialing in my own home. Some were relatively creative, but all were pretty darn simple. None involved reinventing the wheel or unique flavor pairings. 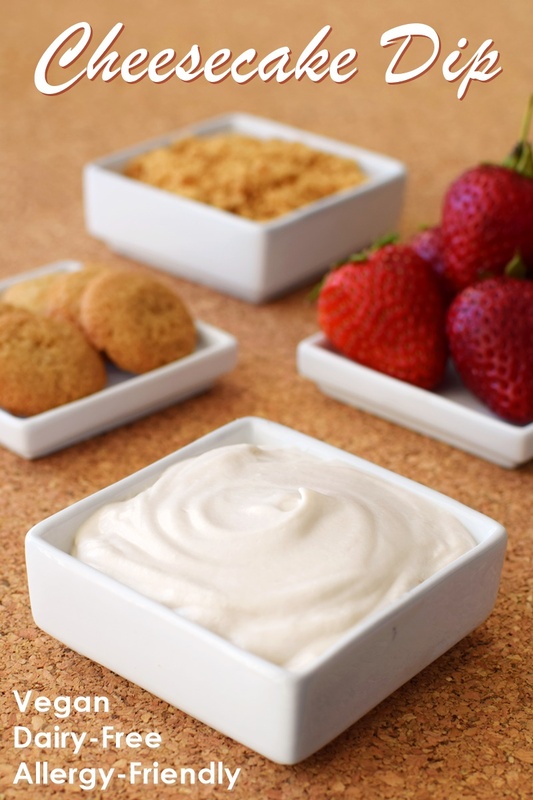 They were just easy twists on old favorites, like this dairy-free cheesecake dip. As a result, you might have noticed how my recipes have begun devolving back to earlier days of recipe creating. 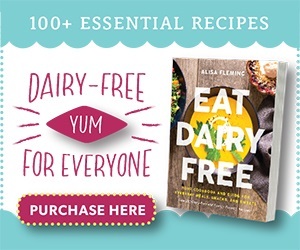 My Wild Blueberry Bliss Smoothie, No Bake Power Cookies, Cookies ‘n Ice Cream Bon Bons, and Herb Drop Biscuits are recipes that I whipped up to add easy deliciousness to your EVERYDAY life. This dairy-free cheesecake dip recipe is just as quick and foolproof. Like the Bon Bons I mentioned, it’s a little indulgent and uses a couple tasty “cheats”. But don’t worry, but both are quite easy to find. 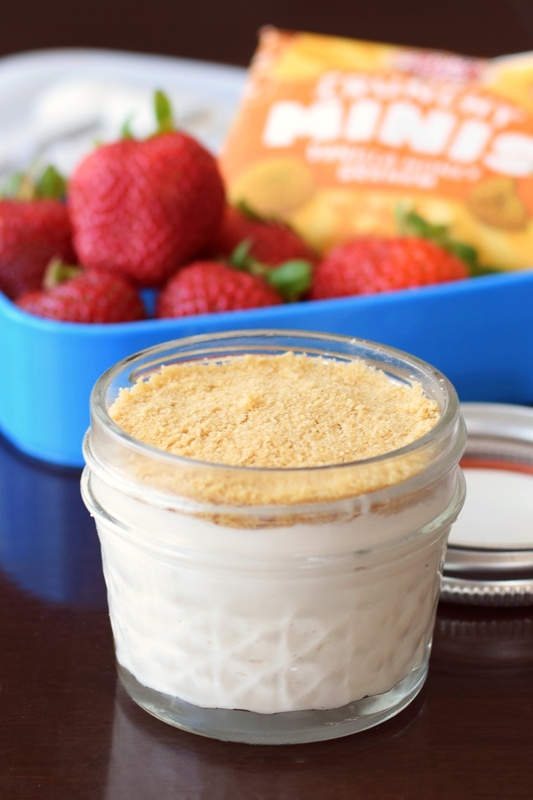 Fresh strawberries and Enjoy Life Crunchy Vanilla Honey Graham Minis are my favorite for dipping in this cheesecake dip. The latter compliment it so well, but strictly vegan treatsters can dunk the Crunchy Sugar Crisp Minis instead. This dairy-free cheesecake dip also packs really well! For lunch boxes, I spoon it into mini jars. Then, I grind or smash Crunchy Vanilla Honey Graham Cookies (or Sugar Crisps for honey-free) and sprinkle them over top of the dip. It’s like an upside down allergy-friendly cheesecake! If you’re concerned about it getting warm, then freeze the jars overnight. Pop a frozen one into a lunchbox and it will defrost by lunch. 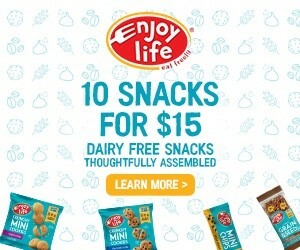 This post is sponsored by Enjoy Life Foods, in honor of their #LunchFreely Back to School campaign! 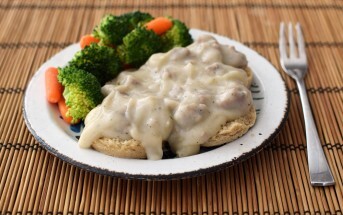 Visit www.lunchfreely.com for some great lunchtime inspiration. 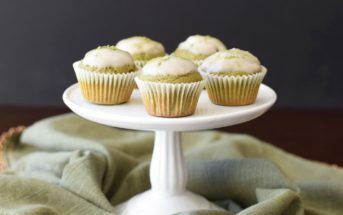 Place all the cream cheese alternative, coconut cream, powdered sugar, lemon juice, vanilla, and salt in a mixing bowl. We like the full amount of vanilla and a scant ⅓ cup of the powdered sugar, but use the lower amounts if you prefer less sweet. Blend the ingredients with a hand mixer or whisk until smooth and creamy. 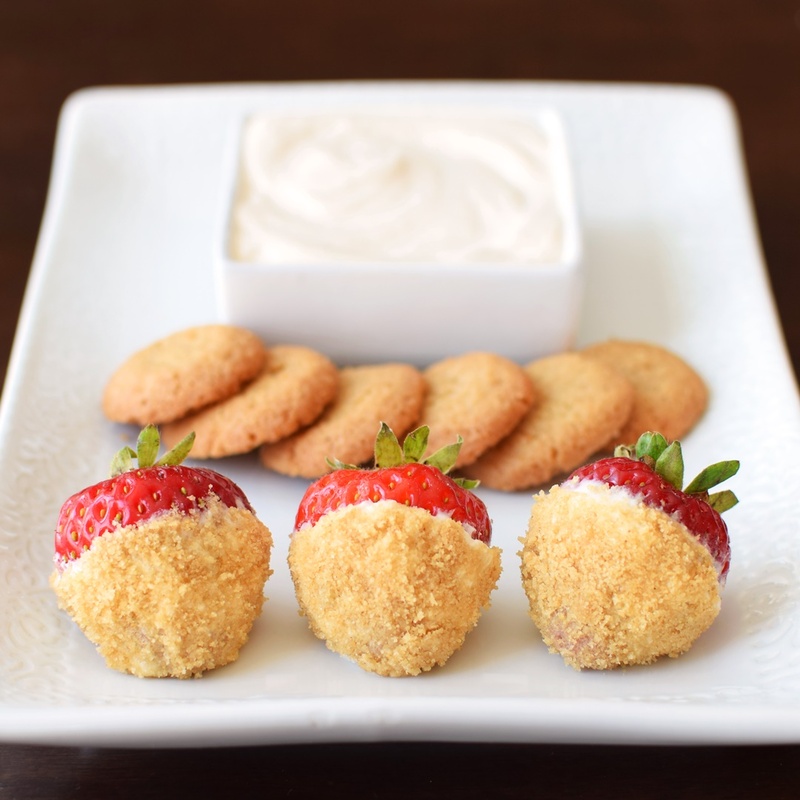 Place the cheesecake dip in a bowl and serve with cookies and strawberries for dipping. You can also serve with crushed cookies for rolling or top the cheesecake dip with the crushed cookies. Leftover dip can be covered and refrigerated for up to 3 days. I also freeze individual portions for an any time treat. Coconut Cream: You can buy coconut cream or chill full-fat coconut milk and use the solid coconut cream that forms. I chill So Delicious Original Culinary Coconut Milk - it turns almost completely into cream! Hi Megan, several are, but they are either soy-based or nut-based. It depends on if one of those options works for you! Ha! You and me and cheesecake lately!! Love it!! I’d love to sit on the couch with a tub of fruit and a tub of this dip. SO yummy! Well, I did that. So worth it! This looks sooo good and easy! Love love cheesecake!! I love the idea of cheesecake dip! Genius!! I love fresh fruit dips- so this one would be perfect and so easy! Indeed! I bet it would be amazing with so many different fruits, too. Sweet and simple- Can’t beat that! Sure sounds more appealing than turning on the oven in the mists of summer, too. What a lovely idea. I would love it with some strawberries! 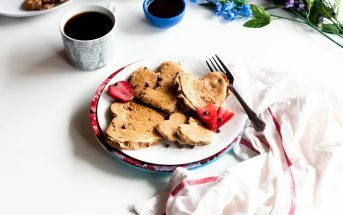 It is awesome with strawberries Mel – I promise you would love it! 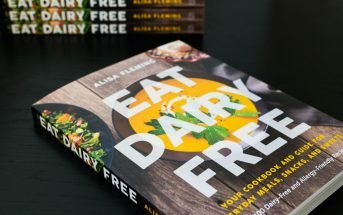 I’ve never tried dairy-free cream cheese alternative, but coconut cream is one of my faves. Bet this dip is delicious, and it looks so pretty. A winner! This sounds amazing and I love, love , love the lunch idea! I love simple recipes! I think my kiddos will love this, too! They would adore it Tiffany!! Those dipped strawberries are PERFECTION. Yum, I love dips for desserts this looks so tasty! I’d actually never had a dip straight up for dessert, but now I’m hooked! My husband owns a restaurant and on the menu they have a cheesecake in a jar!! I love that this is a healthy alternative, this looks so delicious!! What a cool item to get at a restaurant! I’ve noticed a similar trend and also that some of my easiest recipes are the most commented on and shared! 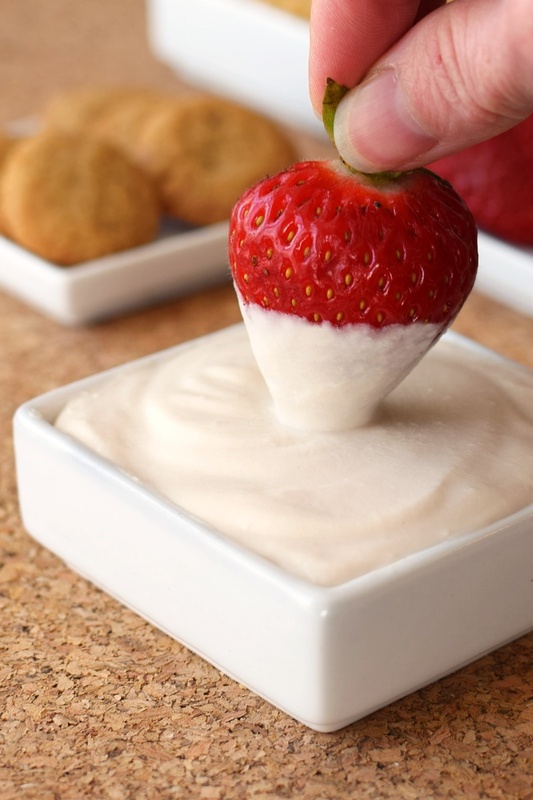 This dip looks delicious – especially love how those dipped strawberries look! Yes, I think all of us are too overwhelmed in life for many of the more elaborate recipes. Thanks Jessica! I remember this type of dip as a child, but it’s not something I ever made as an adult (because of the dairy). This recipe sounds amazing, I am pinning for later!! Well hopefully this recipe helps you reminisce Heather! I am so excited right now! We used to make fruit pizza’s using a cream cheese dip and now that several people in our family are dairy-free, we haven’t been able to make it. We can now!! This sounds heavenly! Perfectly sweet and creamy!